Azerbaijan invites UNESCO to join the process of monitoring cultural monuments in the territories occupied by Armenia. 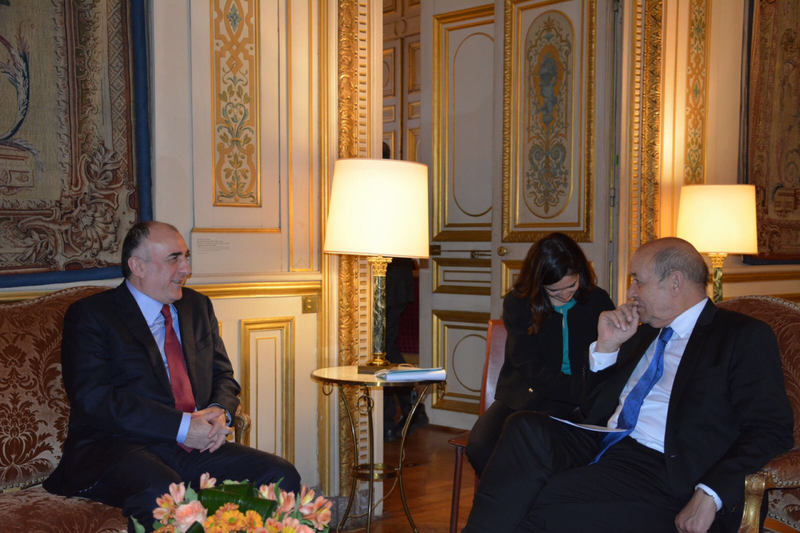 The invitation was announced at the headquarters of UNESCO during the meeting of the Azerbaijani Foreign Minister Elmar Mammadyarov, who is on a working visit to France, with the head of the organization, Audrey Azoulay, the Azerbaijani Foreign Ministry reported on January 16. “Azerbaijan is sensitive to the issue of preserving the country’s cultural heritage. Armenia deliberately destroys cultural monuments in the occupied Azerbaijani territories”, Mammadyarov said, noting that the OSCE monitoring mission confirms these facts. Since the beginning of the Nagorno-Karabakh conflict and occupation of Azerbaijani territories, the Armenian aggressors destroyed 1,200 historical and architectural monuments, looted 27 museums, while over 100,000 items were exported to Armenia. Moreover, the Armenian occupiers destroyed 152 religious monuments and 62 mosques, 4.6 million books in 927 libraries, including the Holy Quran and rare Islamic manuscripts. Mammadyarov and Azoulay further underlined the role of UNESCO in the prevention of contemporary threats, as well as threats in international relations. In this regard, the Azerbaijani FM, noting UNESCO’s importance for Azerbaijan, brought to the attention an exceptional role of UNESCO Goodwill Ambassador, First Vice-President of Azerbaijan Mehriban Aliyeva in strengthening cooperation between the organization and Azerbaijan. Azoulay, in turn, noted that she considers UNESCO's cooperation with Azerbaijan important in the field of intercultural dialogue and stressed the importance of continuing joint activities in this field in future. 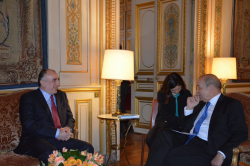 During the meeting, Mammadyarov invited Azoulay to visit Azerbaijan. Later in the day, he met with the head of the French Foreign Ministry Jean-Yves Le Drean. The sides expressed satisfaction with the development of bilateral relations and underlined the importance of high-level visits for further deepening of political ties. Mammadyarov briefed his colleague on the latest status of the negotiation process on the Armenia-Azerbaijan Nagorno-Karabakh conflict. France, along with the U.S. and Russia, is a co-chair country of the OSCE Minsk Group established to broker peace to the conflict. The ministers further expressed their satisfaction with the development of relations between the countries in the economic sphere and stressed the importance of intensifying joint efforts aimed at increasing the trade turnover between Azerbaijan and France. Mammadyarov noted that more than 50 French companies operate in Azerbaijan. “France is represented in the oil and gas sector of Azerbaijan by such companies as “Total Fina Elf”, “Total E&P Absheron” and “GDF Suez E&P”,” he said. He also informed that the Azerbaijani government pays special attention to the development of the non-oil sector. “Taking into consideration the fact that Information and Communication Technologies sphere is among the priorities for Azerbaijan, and France is one of the leaders in this field, the development of cooperation in the field of ICT between the two countries is important,” the minister added. The sides also exchanged views on issues of cooperation in the humanitarian sphere, expansion of the legal framework and issues of mutual interest. France recognized the independence of Azerbaijan on January 3, 1992. The two countries established their diplomatic relations in February 1992. Today, French companies are involved in the oil and gas projects in Azerbaijan as subcontractors. At the same time, French companies participate in the non-oil sectors' projects, including the first Azerbaijani telecommunications satellite Azerspace, and a plant for solid waste recycling. The mutual cooperation between the two countries is expected to bring even more benefits for both Azerbaijan and France in future.